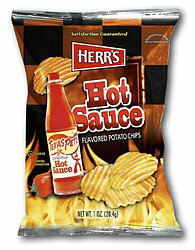 Herr's Texas Pete Hot Sauce Chips. Ripple potato chips seasoned with the authentic pepper zing of Texas Pete Hot Sauce. A great addition to lunch or a snack. Each 1 oz bag has 140 Calories. Ripple chips with the authentic zing of Texas Pete Hot Sauce.